The latest tablet out of Cupertino boasts a 2048-by1536 pixel display. To take full advantage of the graphics allowed by this Retina display, apps need new versions of their graphical assets—and that means bigger file sizes as apps get updated to add Retina display support for the latest iPad. But those updates affect owners of older iOS devices as well. After all, you’re downloading the same app that runs on a new iPad, even if you’re using an iPad 2 or (in the case of universal apps) an iPhone. 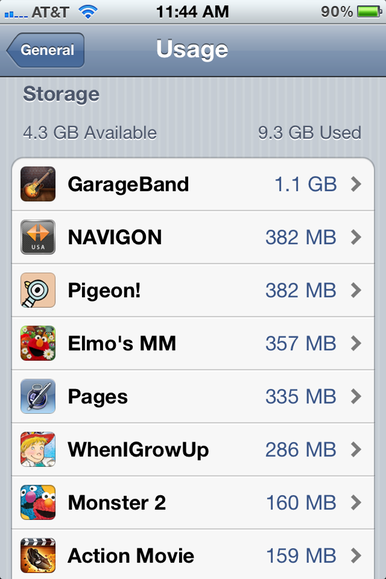 As a result, your 16GB iPhone or iPad may soon start complaining that it’s out of storage space. When that happens—or when your iPhone refuses to update your apps because it says there’s not enough room to do so—resist the urge to start deleting apps willy-nilly. There are better ways to free up room on your app- and data-packed iPhone. If you store a lot of music on your iOS device, and you believe that more storage space is worth at least $25 per year, consider signing up for iTunes Match. With that service, Apple stores your music in iCloud; your entire music library appears on your iOS device, without actually taking up storage space there. So if you currently store several gigabytes of music on your iPhone, signing up for iTunes Match can free up all that space—sort of. iTunes Match on iOS doesn’t actually stream your music; it downloads songs on demand to your device. Once you’ve enabled iTunes Match by signing up in iTunes on your Mac, you can instruct your iPhone or iPad to wipe out its collected store of cached, downloaded songs as needed. Clear out your iTunes Match cache to free up some precious space on your iOS device. Here’s how: Launch the Settings app, tap on General, and choose Usage. Wait a moment as your iOS device calculates things. Once the list appears, find the Music line item. 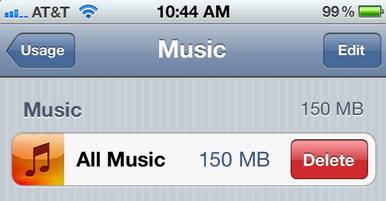 Now, you can swipe across Music to bring up the Delete button; tap that, and your cached music gets removed. Remember, this won’t impact your ability to enjoy your music on your iOS device. Thanks to iTunes Match, you can keep playing back your music from iCloud whenever you’d like—this trick just clears out songs iTunes Match downloaded to your device, but you can always get them back again. If you see very large apps that you don't use often (or at all), you can delete them from right on this screen. We said at the outset that you shouldn’t start deleting apps at random when you need to free up space. Instead, you want to delete those apps you use the least, but take up the most space. And if you’re still at the General -> Usage section of the Settings app, your iOS device will make identifying those apps as simple as possible. In fact, the Usage screen lists all of your apps from largest to smallest. If you see, say, GarageBand or iMovie listed at the top—each of which gobbles up more than a gigabyte of storage space—and you never use those apps, now might be the time to bid them a fond farewell. Remember that you can always reinstall those apps, should a need to use them arise. You can access your old, no-longer-installed apps from the App Store app on your iOS device, or using the iTunes application on your Mac (or PC, if that’s how you roll). On an iPad, tap the Purchased tab; on the iPhone, tap the Updates tab and then select Purchased. Then you can tap the Not On This Device tab to see a list of all the apps you don’t have installed, sorted by either name or installation date. You can delete apps from right within the Usage screen: Tap the name of the app you’d like to remove, and then tap the big Delete App button. If you look through the Usage list, you might find another line-item: Video. You can’t remove the Video app, but you can remove individual videos you’ve stored there. If you synced a couple movies eons ago and no longer need them, now’s a fine time to remove those, too. As the cameras improve on iOS devices, the photographs that those cameras snap get larger and larger. A photo snapped with the iPhone 4S’s rear camera typically weighs in at close to 2.5MB. Take a couple hundred photos with your iPhone, and suddenly you’re talking about a half a gigabyte of pictures. Throw in some HD video shot with the camera, and file sizes swell considerably; such video can consume 2.5 or more megabytes per second. If you’re a frequent iPhone photographer, regularly clearing out old (saved!) photos from the phone is a must for freeing up storage space. Speaking of photos, you can give yourself a head start on keeping your iOS device’s Camera Roll from filling up prematurely by configuring things smartly on an app-by-app basis. Third-party camera apps like Instagram and Camera+ offer options to control where your photos are saved—only within the app, or within your Camera Roll, too. 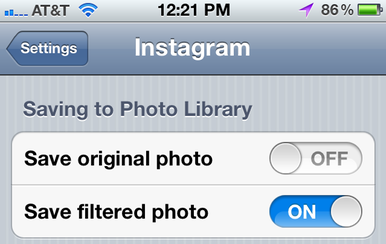 And some—again, like Instagram—let you specify whether you want the original photo saved, and edited version saved, both, or neither. Explore your app’s in-app settings, and check the Settings app too. If you don’t need to save the app’s photos to the Camera Roll, or you at least don’t need multiple versions of each photo saved, configure things accordingly. This story, "Free up space on your iOS device" was originally published by Macworld.